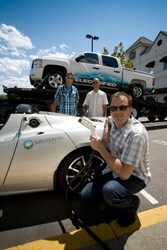 Greg Salloum (center) stands with members of Sun Country Highway, Kent Rathwell (left) and Rob McGregor (right), who installed the first electric vehicle charging station in Kelowna. We really care about environmental sustainability, so we’re always looking for ways to help reduce our carbon footprint and help guests feel good about being kind to the earth while they travel. When the BEST WESTERN PLUS Kelowna Hotel & Suites installed its first electric car charging station last summer, staff was keen to see how much the stall would get used. But as electric cars left and others continued pulling in, the hotel quickly realized one plug-in wasn’t enough. Complementary to all hotel guests, each of the three 90 volt charging stations can take an electric car from ‘empty’ to ready in less than two hours. The hotel wanted to install charging stations as the next step in the hotel’s sustainability plan, and to accommodate the growing numbers of electric vehicle owners in BC. According to BC Hydro, by 2022 the province will have 100,000 electric vehicles—including hybrids—on the road. Over the years, the Best Western has been recognized several times as one of the ‘greenest’ Kelowna hotels. With environmentally friendly initiatives ranging from a solar hybrid water system to a lawn raked with Nature’s Gold rather than fertilizer, the hotel often reduces its annual carbon footprint by 300 per cent. Since 2006, the BEST WESTERN PLUS Kelowna Hotel & Suites has won numerous awards, including the National Energy & Environmental Award and the BC Minister’s Award of Excellence for climate action. This Kelowna hotel has been Climate Neutral Certified and has also received the LEED silver certificate for building an environmental wing, a 4 Green Key Eco-Rating, and has Green Tourism Canada certification pending.